The Gionee P7 is the most compact version of the Gionee P7 Max. It has a 5-inch IPS display with 5 MP front and 8 MP rear cameras. Gionee P7 is loaded with Android 6.0 (Marshmallow). Gionee P7 is powered by a 1.3 GHz quad-core processor with 2GB of RAM. 16GB of storage for storage with a slot that supports up to 256GB of microSD memory card. Gionee P7 supports 4G LTE, Wi-Fi, Bluetooth 4.0 and microUSB 2.0. The Android phone has a battery of 2300 mAh. 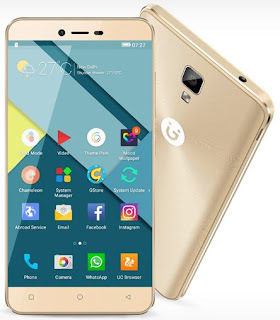 Gionee P7 is not yet available in Nigeria and Kenya. At the moment, we have no information on prices and availability for Nigeria and Kenya. Gionee P7 was launched in India for INR 9,849. If available, the Gionee P7 price in Nigeria should be between 46,500 and 70,000 nairas, depending on your location in the country.